I learned how to listen to gamelan in the womb. Quite literally, in fact; my mother, an American musician and ethnomusicologist, would play Balinese gamelan when she was pregnant with me, sitting cross-legged on the floor, her ever-swelling belly pressing against the bamboo resonating pipes of the instrument she played, the Balinese gendér, one of the loudest acoustic instruments in the world. To me, as a baby, gamelan music was simply music itself. But I understand that gamelan music can be polarizing. It can be hard to appreciate at first — difficult to sing, certainly, hard to dance to, and it can be a challenge to even find a thread to which to tap your foot. 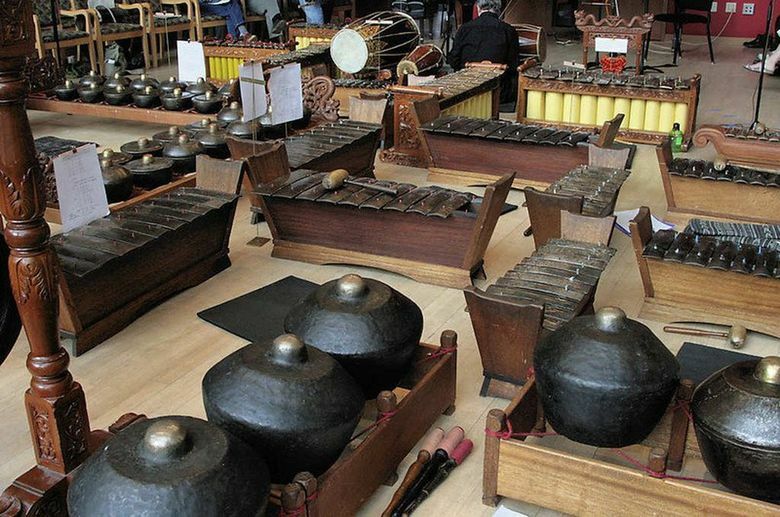 The gamelan is the symphony orchestra of Indonesia, a collection of melodic percussion instruments played by a group of musicians each responsible for their own part of a complicated matrix of sound. The primary instrument is the gendér (the “g” is hard and the word sort of rhymes with “bender”), a metallophone instrument that looks a bit like a marimbas with brass keys and bamboo resonating tubes, but there are also giant brass gongs, smaller horizontal gongs, sideways drums and even high-pitched flutes. The musicians keep time with intricate interlocking rhythms with waves of deep bass, sonorous clanging and piercing tinkling that, together, create a dense web of sound that is felt as much as it is listened to. Gamelan music is atmospheric, and when you first encounter it, you listen best when you do not listen too hard, instead allowing the rhythmic repetition to build around you like ocean sounds alternating with the regular beats and blinks and gurgles of your own body. Much of it is a traditional, high-minded form of royal court music that, ironically, modern-day enthusiasts of electronic dubstep or even prog rock are best equipped to appreciate. Some even describe it as musical math, which is not entirely unfair but fails to capture the undercurrent of cinematic emotion that gamelan can evoke. While gamelan is hardly mainstream in America, there has long been a close-knit community of musicians across the country who cultivate gamelan ensembles stateside, and you can usually find a group in any major city. Seattle’s gamelan is Gamelan Pacifica, a Javanese-style gamelan group, whose next concert is Saturday, March 23, at Chapel Performance Space in Seattle. It was founded in 1980 by composer Daniel Schmidt (who headed the esteemed Berkeley Gamelan) and currently led by Cornish College of the Arts professor and composer Jarred Powell. The instruments themselves reside at Cornish, in Powell’s studio. “We got our start among composers, really, who were interested in building instruments and exploring other intonation systems,” said Powell, explaining that early members crafted instruments out of aluminum and plastic tubing, drawing out the ethereal sounds of gamelan’s non-Western pelog and slendro tuning systems (that create notes outside of those you can hear on a Western piano) and using them in their own original compositions. Nowadays, Gamelan Pacifica plays on a set of authentic Javanese instruments, but the creative ethos of Gamelan Pacifica remains the same, allowing original composition to bleed into the “traditional,” making it clear that, for them, music is not so much about drawing lines about what is “authentic” and “not authentic” and entirely about the music itself. Powell has even produced shows intended to help people understand the similarities between gamelan music and music they might be more used to listening to, once playing gamelan music head to head against the chamber music of Bach. In classical circles, that’s pretty metal. 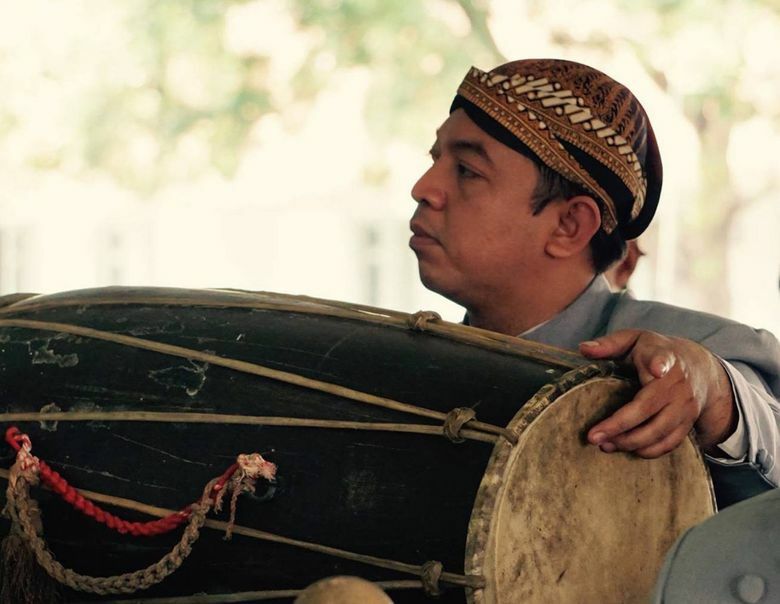 That said, Gamelan Pacifica’s upcoming performance on March 23 is more on the traditional side, featuring guest artist Darsono, a prominent Central Javanese musician (and master shadow puppeteer) with whom Gamelan Pacifica will play the refined music of the Solo region. Its sweet, gentle sound is an accessible first toe-dip for the uninitiated; you won’t need to know anything about gamelan to enjoy gamelan. Simply go to the concert, sit in the dark, and feel the music swell around you and learn to love it the way I probably did, back when I was a pre-baby and knew nothing about scales or microtones or ethnomusicology and just felt the music pulsing around me, believing that constant, undulating rhythm to be the sound of the whole world. Tantri Wija: the.twija@gmail.com; Tantri Wija is a Seattle-based freelance writer.